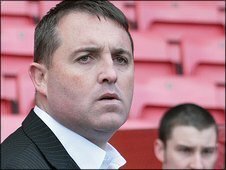 Swinton have named former Barrow boss Steve McCormack as their new head coach for next season. McCormack will replace Paul Smith, who left the Championship One club earlier in the year. The former Salford, Widnes, Whitehaven and Gateshead boss resigned from Barrow in August to pursue a teaching job. He is currently coaching the Scotland squad and will take over at the Lions on a part-time basis so he can continue with his education post in Wigan. Welsh international Ian Watson will stay on as McCormack's assistant.